Quick disclaimer: I wrote about this trip and had it published in the April-June 2016 TEC Newsletter. I have tweaked it a little bit so it wasn’t exactly the same as what I had written for TEC. For anyone not currently a member what are you waiting for? These are the type of articles you can read about in the newsletter each quarter. We have a lot of fabulous members with really great stories and tips you just won’t find anywhere else. This is the only time I’m going to post the same adventure here and in the newsletter, and I hope TEC will forgive me for giving a free sample. I really just wanted to give you an example of what you can expect when you become a member. Sign up today so you don’t miss the next issue. On a side note I was the second runner-up in this years design contest (patting myself on the back, I’m a really terrible artist but had fun designing). Congratulations to Jason Armstrong for his winning design I can’t wait to receive my pressed copy in the mail. See all the fun your missing by not being a member. I was in Philadelphia the other day on business which was right near their city hall. When my meeting was over I asked my hosts if there was anywhere good to eat nearby. 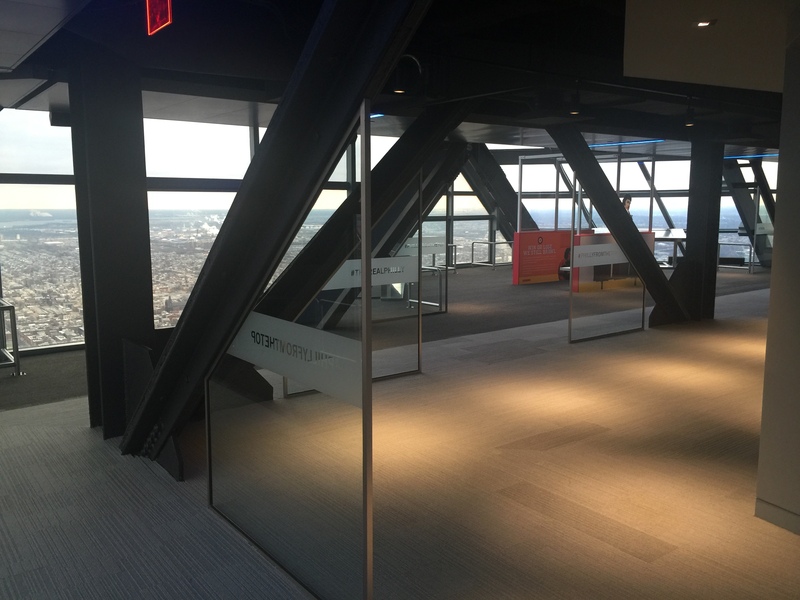 They then asked if I had ever gone up to the observation floor in One Liberty Place that was just a few blocks away. I said that I had not and didn’t even know about it, which immediately got them all riled up and they insisted I go before leaving the city. How could I say no. With some time to spare we made the short walk over and as you can see from the picture above this is a beautiful building. 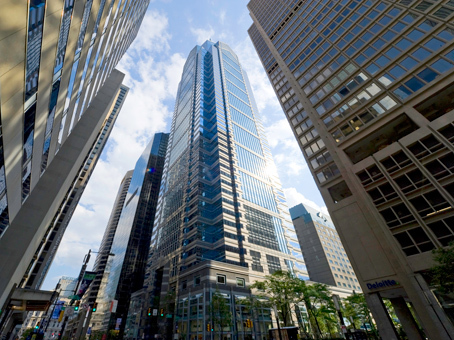 It’s filled with office space as usual, but also has a shops and a food court on the lower levels. 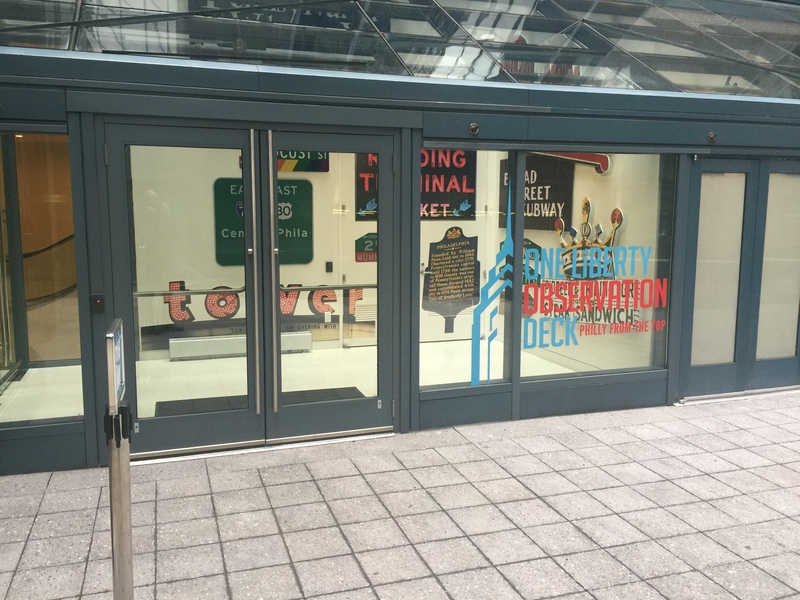 As you walk up there is a separate entrance for the Observation deck, and there are numerous staff members around to ensure you don’t get lost. There is a fee which isn’t too bad, but I promise you will forget all about it once at the top. 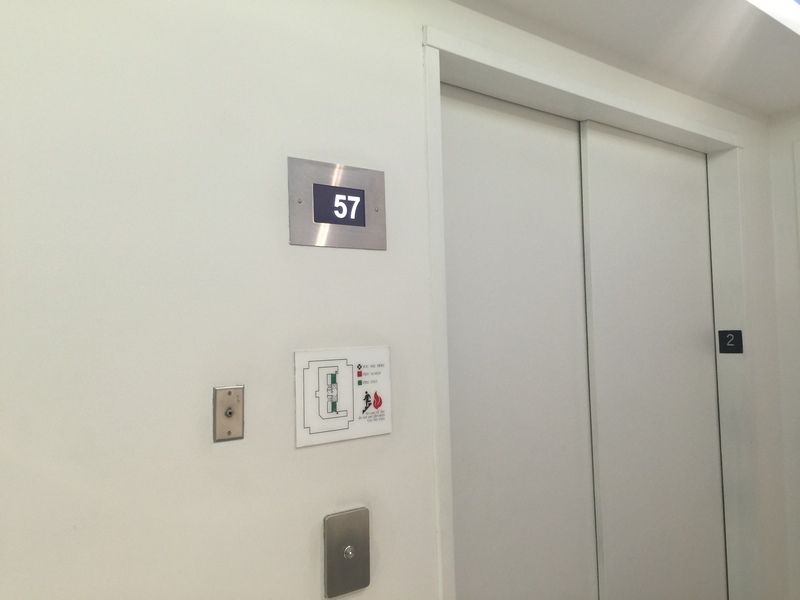 The picture above shows the elevator coming back down from the 57th floor, and would be our ride up to the top. Being that my visit was in the middle of the week and in the early afternoon there weren’t many people here which was kind of nice. After the quick elevator ride (there’s a video you get to watch so you forget how high you are going), we walked out onto the observation floor and I was blown away by the view. Unfortunately the day was a little overcast but the views of the city were really gorgeous. We had the entire floor almost to ourselves and was able to stroll around the entire level trying out the interactive displays exhibits and just enjoying the break from work. At one point I sat down in a comfy chair just enjoying the view when I saw something out of the corner of my eye. A penny machine how cool. Years ago I pressed some coins at the Empire State Building’s Observation deck in New York, so these weren’t necessarily the highest altitude pennies I have ever collected but still a nice surprise. I quickly pulled out my emergency package of coins and pressed myself a set. The designs are very Philly themed as you might expect. 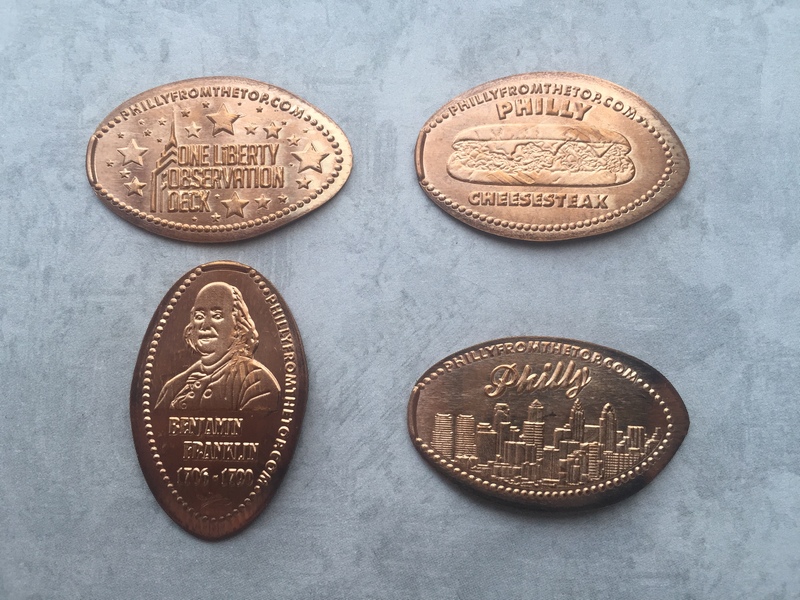 The images included the One Liberty Observation Deck, a Philly Cheesesteak, Benjamin Franklin and the Philly skyline. 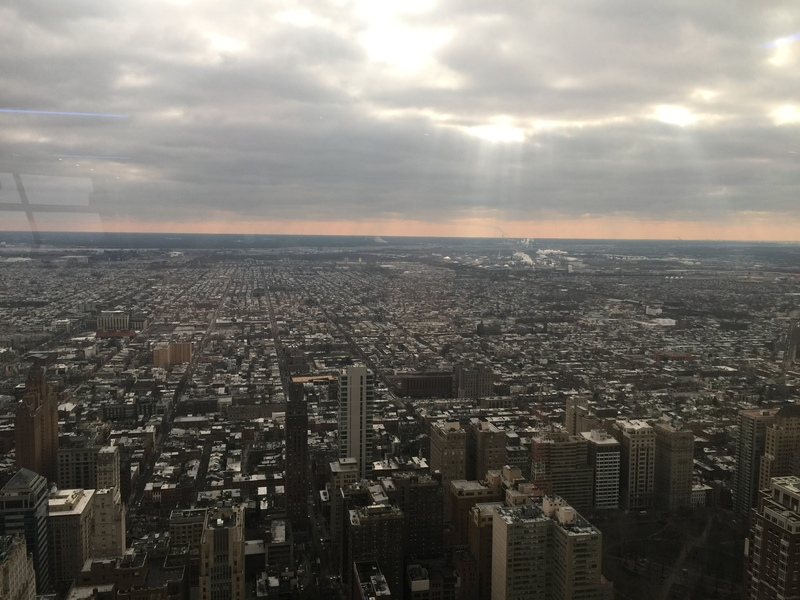 I’m not going to lie, when I saw the cheesesteak design it made me hungry so after finishing up my visit on the 57th floor I headed back downstairs and grab one for a late lunch. 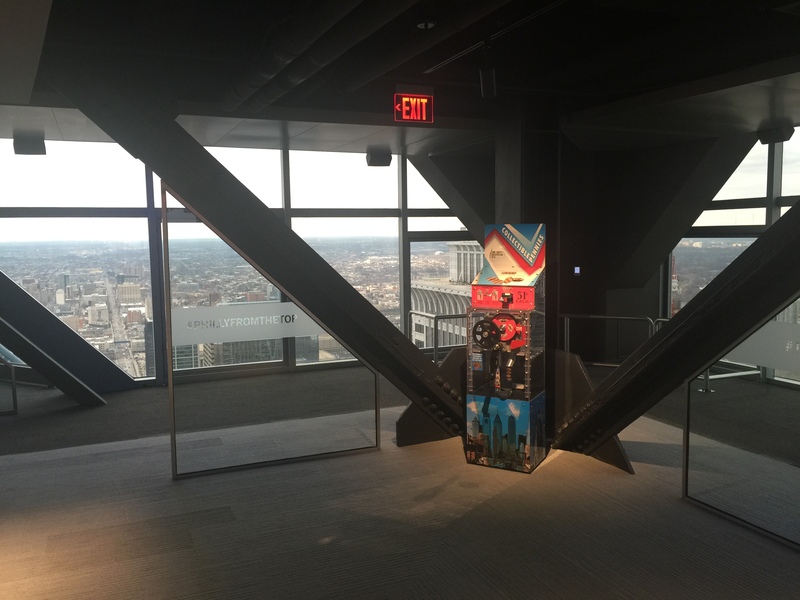 This observation deck was really awesome and one of the best I’ve been to. I’m not sure how enjoyable it would have been if it was crowded but being one of only a handful of visitors that day made it very relaxing and enjoyable. Plus there aren’t too many place where you can press a set of coins over 750 feet in the air. ← Philadelphia Zoo 2016 – New Machines! !